So, we finally get to play with some ICs now! I feel I have quite a good understanding of the basic components now, so in the coming weeks I shall have a go making some circuits up using transistors etc. 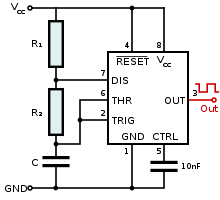 - Monostable mode - This means that when the IC is triggered it produces one pulse, it can be used to trigger other ICs. A square waveform pulse is produced. is useful for flashing LEDs, producing tones on speakers etc. A square waveform is produced. - Bistable mode - When triggered the IC acts as a flip flop, this is useful to remove the bounce (http://www.elexp.com/t_bounc.htm) from a switch. I don't really know much about flips flops, but I guess later on in the book when logic will have been covered I'll have a greater understanding of the concept. This experiment uses the 555 timer in 'monostable' mode, when we trigger the chip, it will emit a pulse of a length determined by the capacitor attached to pin 6, the larger the capacitance, the longer the length of the pulse. The circuit is wired up so when a button is pressed, it pulls pin 2 low, triggering the IC, a pulse is delivered on pin 3 thus powering the LED in the circuit. 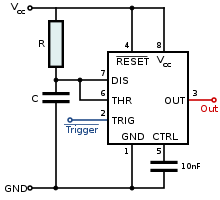 A potentiometer is connected in between the switch (connected to the trigger) and ground, by varying this pot, the pin is pulled to differing voltages, only if the pin is pulled below 1/3 of the supply voltage will the IC be triggered. I plan on playing a bit with this chip and documenting my experiences further, I'm getting quite a good idea of how to use it.